A Big thanks to my good friend Jorge from Brewerianimelogs for the sweet hook up. You will be seeing a lot of different beers being reviewed on my site that are not available in TX, but thanks to Jorge, these reviews are made possible. I have been aware of Stillwater Artisanal Ales (Maryland) due to their amazing artwork on their beer labels. Naturally, the Metal side of me was attracted to these, so I was very excited when this bad boy was included in one of my packages. It is a Belgian style beer, which have been a favorite of mine for a while now, again, I was extremely excited for this beer! Stillwater Artisanal Ales first made this beer in 2012 to celebrate the company’s 2 year anniversary, and to celebrate the end of the world, which was said to happen later that year. Well, obviously that did not happen, and we are now in 2014 and moving forward! As Follows was also first known as an Eschatological Ale, which of course, Eschatology is the study of the apocalypse. 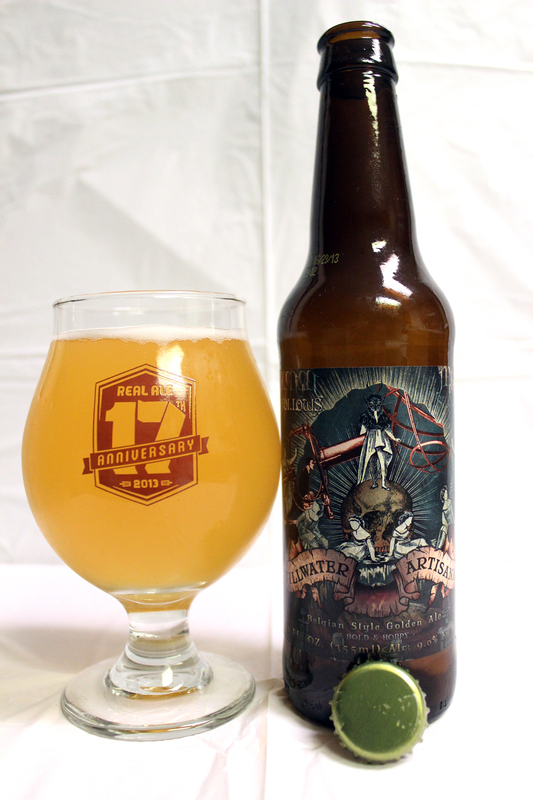 Stillwater brewed this beer again in 2013, and dropped the Eschatological Ale and replaced it with Belgian Style Golden Ale on the label. The label has a very nice cut and paste style artwork that reminds me of a lot of album covers by Napalm Death. The label depicts what I believe is a scene from Hell. There is a devil figure standing on top of a skull with faceless women sitting at his feet. There is also a man that appears to be looking through a large telescope towards the heavens. At least this is what my mind sees in this artwork! Ha ha! Poured from a 12 oz bottle into a Real Ale 17th Anniversary (2013) snifter glass, As Follows poured a murky bright golden color topped with a thin bubbly white head. Not much lacing left down my glass, only small web-like lines. The color is amazing though! The aroma is a grand mixture of scents. There is the obvious aromas of the Belgian yeast with traces of banana, peppery spices, bread, and a hint of lemon. As promised by the brewery, this one is hoppy. This is an interesting twist on this style, as Belgian style beers usually aren’t very hoppy. There is hop aromas like citrus, and a small hint of pine/grass, but mostly citrus fruit. This added in with the normal aroma of a Belgian beer made for a perfect blend. The taste was very similar to the aroma. All the characters were present. My friend Jorge said it best on his site; “It is like taking an IPA and aging it with fruits and yeast.” Hops are usually dominant and up front in most cases for some, but for me, especially with this beer, the hops took a back seat to the Belgian qualities. Banana, peppery spices, bread, lemon, almost farmhouse yeast flavors hit the palate first. There is a nice body of flavors of grains, and of course, hops! Citrus fruit and small taste of grass or pine from the hops are present. I am in love with the full flavor of this beer. The body is a tad over Medium, leaning towards a heavy body. The mouthfeel is silky, and smooth, with a nice coating leftover on the tongue. The finish is slightly dry, but not much. Like other Belgian style beers I have had, the 9% ABV is well hidden, which could be a bad thing, since that makes the beer easy to drink fast. Or, is that a good thing? Overall, I was much appreciative to my friend Jorge for sending me this little gem of a beer, as I highly enjoyed it. I do, however, wish I had more bottles of this good stuff. I have grown fond of Belgian style beers over the past few years. I remember there was a time, when I hated them, and avoided them like the plague. Then, one day I just tried one again, and found out the good qualities of the style, and have never looked back again. This was an excellent introduction to Stillwater Artisanal Ales for me, as this was the very first one I ever had from them. I do have a few more in my storage now, and I am really looking forward to them. Metal Connection: The band, MASTER wrote this song “Follow Jesus” from their 1998 full length release, Faith is in Season is a perfect fit for this beer name. The lyrics are about having faith is false idols that will lead you to an early grave. In this case, the beer is called As Follows, and the label suggests the end of the world and a Heaven and Hell. Who do you follow? Where do you go when you die? Of course, if you believe in all that stuff. Master is one of the longest running Death Metal bands having formed in 1983, and are still actively putting out albums and touring. Paul Speckmann, the mastermind behind the band has moved from Chicago all the way to the Czech Republic where the band has been residing from for the past several years.